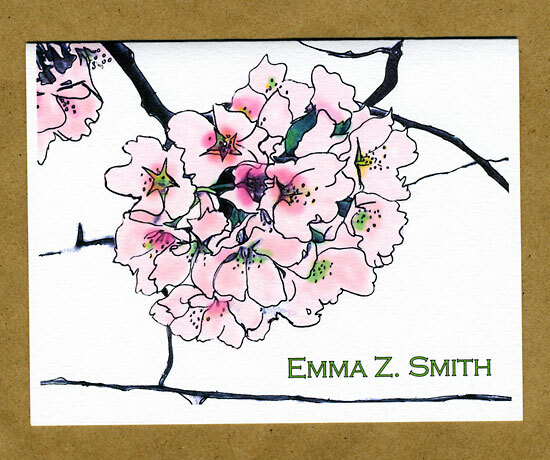 Inspired by the cherry blossoms surrounding the Tidal Basin in Washington, D.C., there are four variations on these gorgeous blooms at Fast Snail. This version combines pink petals with bright candy colored accents. Choose from three different font selections: Plum Copperplate, Green Copperplate, and Black Lithos. 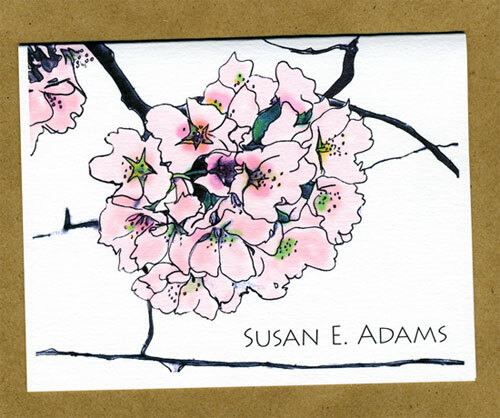 5.5" x 4.25" folded notes are printed on heavy bright white stock from sustainable forests and come with your choice of pale pink, pale green, or matching white envelopes (see thank you notes and plain notes for envelope colors). Set of ten notes is packaged in kraft box with clear plastic lid and tied with coordinating fabric ribbon. If you like these, there are also pale pink, white, and confetti personalized versions to tickle your fancy. 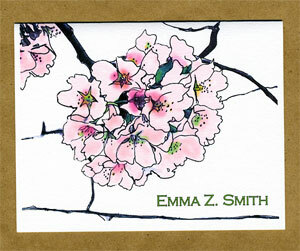 You may also order a non-personalized version of these note cards.